These Chocolate Peppermint Cups have a coconut butter peppermint filling, surrounded by homemade dark chocolate. 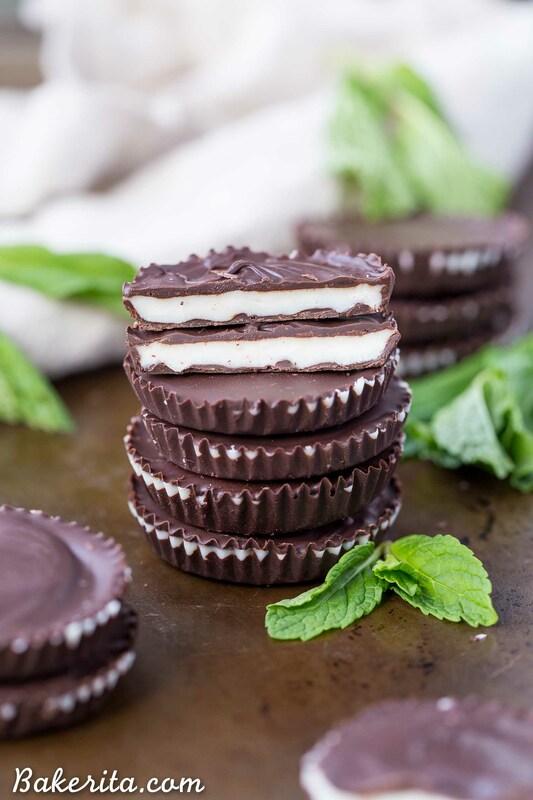 You’ll love these easy to make, gluten-free, paleo, and vegan homemade peppermint patties. I’m a fiend for chocolate cups filled with creamy, coconut butter goodness. I’ve made them myself a few times, most notably these Chocolate Strawberry Cups, and I’m a MAJOR fan of Eating Evolved‘s many coconut butter cups (the caramel sea salt is to die for). I’ve also got a TON of non-coconut butter filled cups on here, like my Chocolate Chip Cookie Dough Cups, my Chocolate Pretzel Peanut Butter Cups, and the more classic Chocolate Peanut Butter Cups, but I digress. We’re here to talk about melt-in-your-mouth, coconut butter-filled bites of goodness! I’ve had it in my head to make a peppermint patty type of candy for a while now, but it didn’t seem appropriate to share until it was really the holiday season. Meaning, finally slightly cold in San Diego and December. Luckily, once I finally got around to making them, it was so quick and simple and they were on my table, ready to be eaten, within a half hour. Even better? They’re made with super clean ingredients, so no need to wonder what the heck you’re eating. Even the chocolate is homemade! And I bet you’d never guess it could be this simple…only three ingredients, and NO cooking required. No tempering or annoying stuff like that here  just a bit of melting, and stirring. For the homemade chocolate, we combine coconut oil, cocoa powder, and maple syrup. That’s it. Melt, stir, voila. Make sure to use high quality ingredients, especially the cocoa powder, because you’ll definitely taste the difference! The filling couldn’t be more simple – just coconut butter and peppermint extract! The amount of peppermint extract called for was perfect for me, but taste it and add more if you’d like. Just be sure to taste as you go, since peppermint extract is strong! 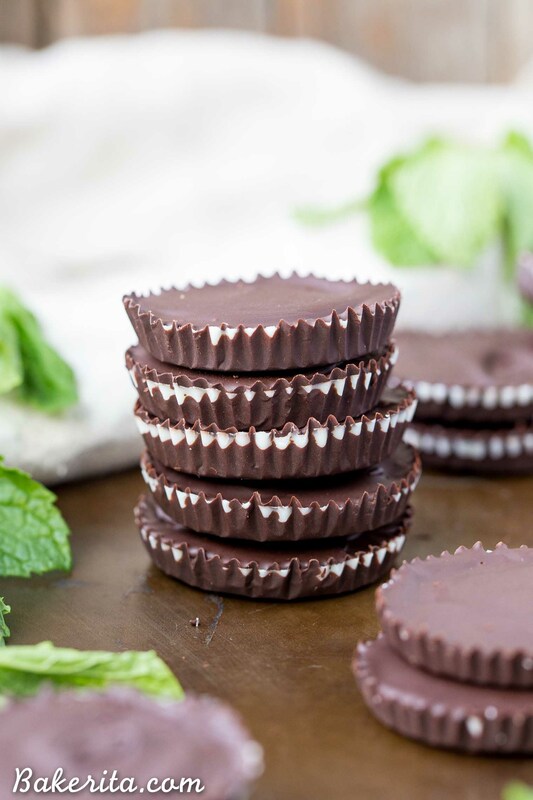 The resulting chocolate peppermint cups are the perfect after dinner snack, to satisfy your sweet tooth and make your breath minty fresh :) these cups just melt in your mouth, and are perfect for gifting this holiday season too. Enjoy! 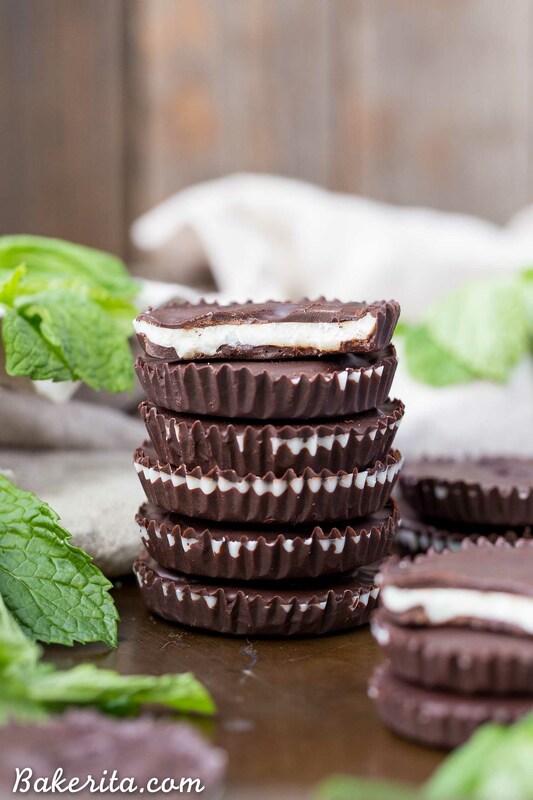 These Chocolate Peppermint Cups have a coconut butter peppermint filling, surrounded by homemade dark chocolate. 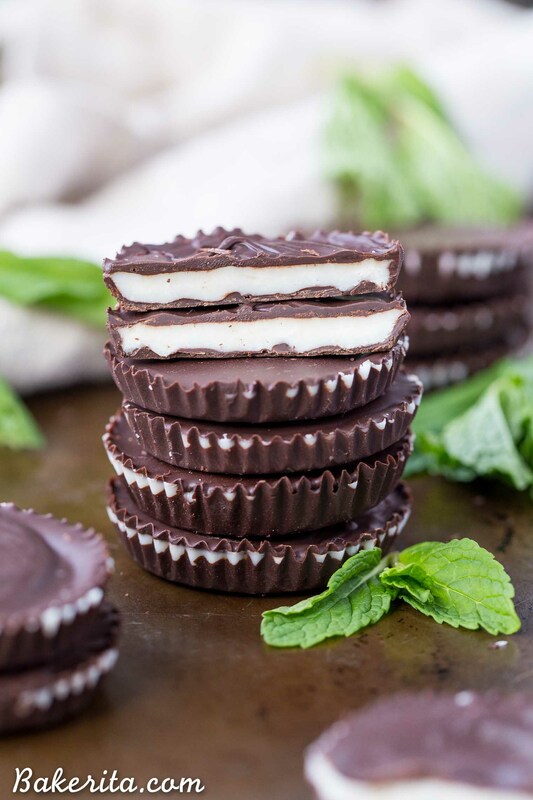 You'll love these easy to make, gluten-free, paleo, and vegan homemade peppermint patties. Line a muffin tin or mini muffin tin with small cupcake liners. In a liquid measuring cup, whisk together the melted coconut oil, cocoa powder, and 3 tablespoons maple syrup. Taste it, and add more maple syrup if you want it sweeter. Pour a small amount of the chocolate mixture into the bottom of each liner or mold cavity, until the bottom is thinly covered. Don't use more than half the chocolate mixture for this. Place the liners in the refrigerator for about 10 minutes to harden. While the chocolate hardens, stir together the coconut butter and peppermint extract. Once the bottom layer of chocolate is hard, place about 1 teaspoon of the minty coconut butter over the chocolate. Pour enough of the chocolate mixture over the coconut butter to cover it completely (if at any point the remaining chocolate gets too thick, warm it in the microwave for 10-15 seconds to remelt). Repeat until all are covered. Return to the refrigerator to harden completely. If you want the cups to store better at room temperature, you can also melt your favorite dairy-free chocolate to use instead of making your own. Oh yes! Thanks, Rachel for sharing these amazingly tempting treats! 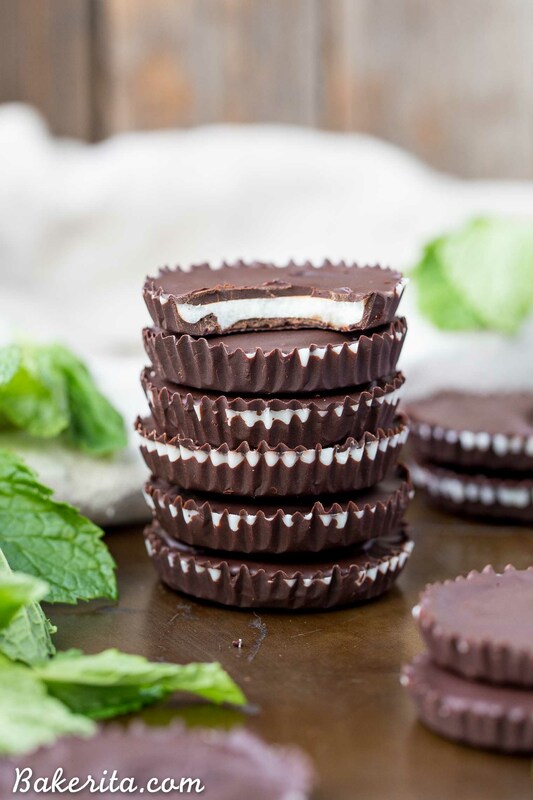 I love minty chocolates this time of year and I’ve never tried them like this! They’re the perfect holiday treat! Thanks so much Tori. This looks delicious! If you were to use chocolate instead of making it, how much chocolate bar would you use? Hi Michelle, I’d guess it to be probably 4 oz. of chocolate. Enjoy! Is there any substitute for coconut butter? I don’t get any coconut butter here but we do get lots of coconuts.